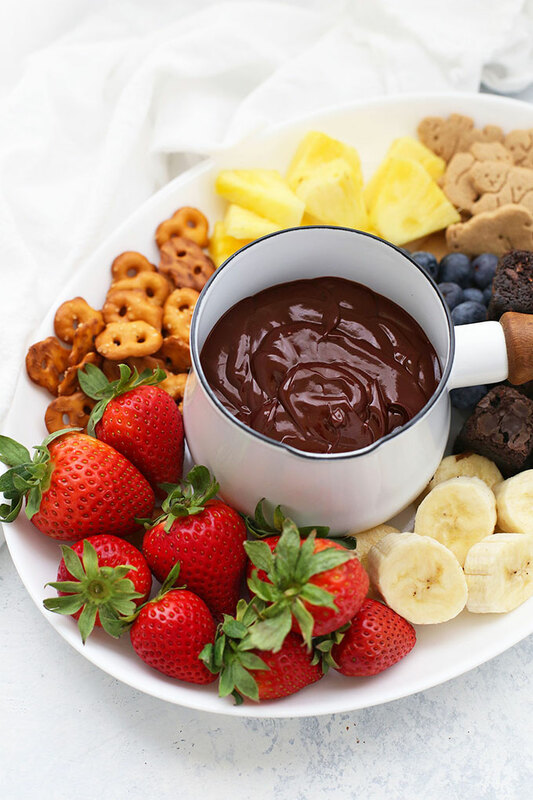 High Quality Chocolate (Preferably Bars) – I recommend using semi sweet chocolate bars instead of for chocolate fondue, if you can. Chocolate chips (especially the cheapest ones) are often made with stabilizers (to help them keep their shape when baked), so sometimes they won’t melt quite as much. Guittard semi-sweet or extra dark chocolate chips. A bit of (nondairy) milk or cream – My preference for this recipe is the more neutral-tasting dairy free milks, like unsweetened almond milk or cashew milk. I don’t use too much, but feel like I hit the sweet spot of rich and indulgent, while still being thin enough to dip easily. A Small Pan – I have this adorable little “butter warmer” that’s perfect for a small job like this. 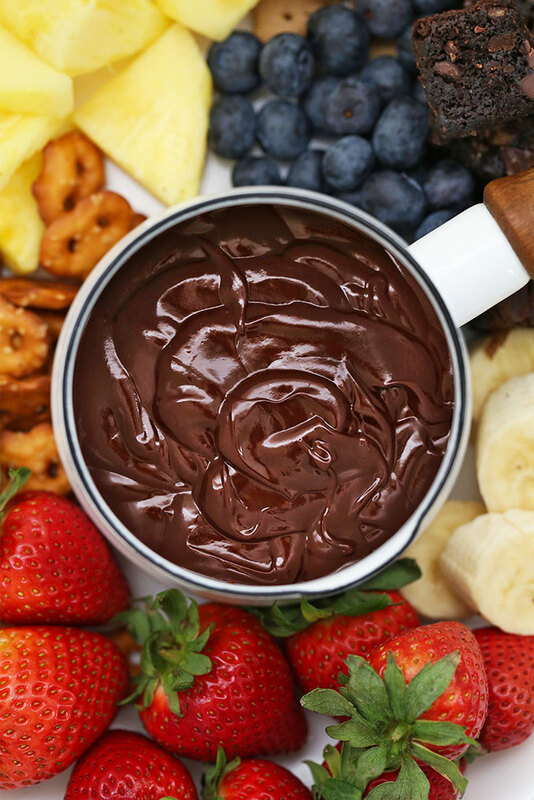 It’s just the right tiny size for a small batch of chocolate fondue, but you could just as easily use a larger pan. 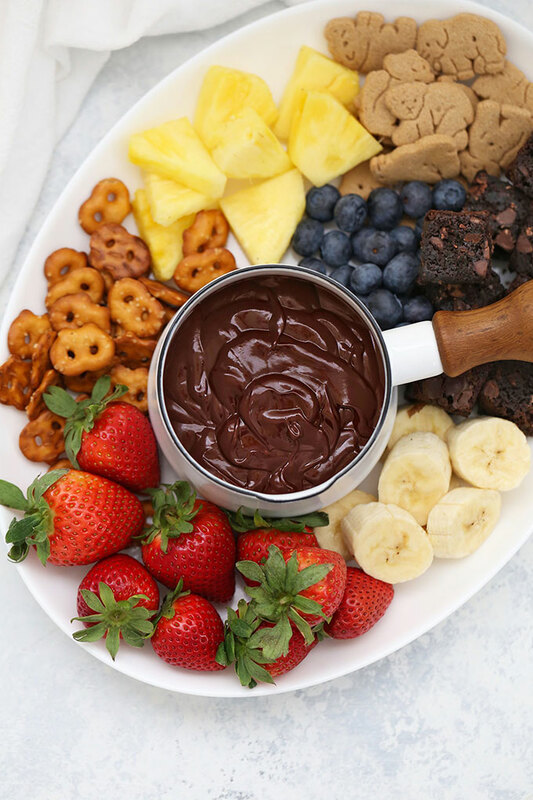 Or, you can pour it into a pretty dish for serving, or get a fancy fondue set-up if you want to go big. WATCH OUT FOR WATER – If your pan, serving bowl, etc. has water on it, it can cause your chocolate to “seize,” and turn grainy. You want to be sure everything is clean and DRY before starting (you can’t really rescue seized chocolate). 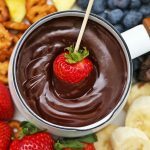 KEEP YOUR CHOCOLATE FONDUE WARM: You can keep chocolate fondue warm with a portable hot plate, or you can certainly buy a fancy chocolate fountain or fondue warmer like this or this, but I’ve found that this dairy free chocolate fondue goes fast, so I don’t really need to keep it constantly warm. At our house, I warm it up on the stove while I’m getting all the dippers ready, then we move it over to the table and everyone dives right in! SET OUT SKEWERS – I love reusable kitchen tools whenever possible, but I don’t recommend metal skewers in this case because they’ll likely scratch your pan. For the sake of your pan, I recommend using bamboo skewers. You can even “mark” them with different colors of washi tape if you want! 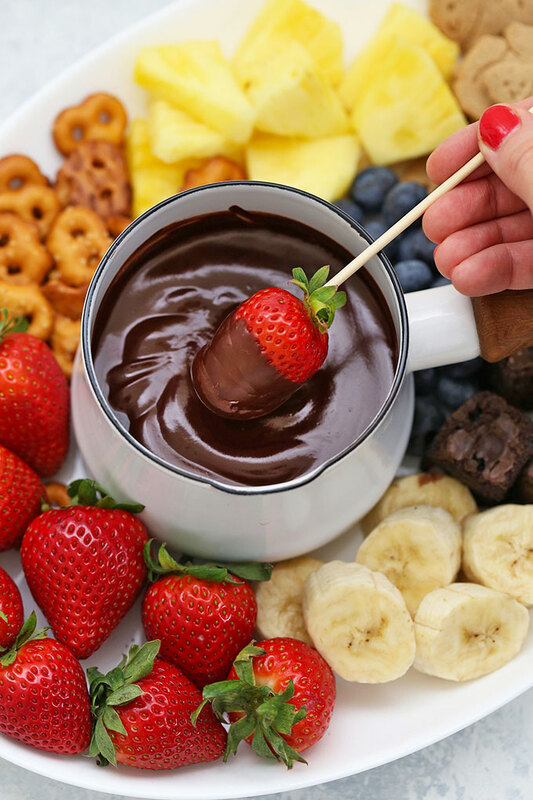 HAVE PLENTY OF DIPPERS: What makes fondue so fun is adding lots of fun dippers! 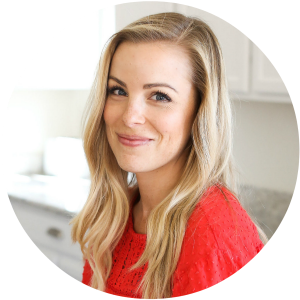 For lots of gluten free and dairy free ideas, check out all my favorites below! Banana slices – So good with chocolate! Clementine Segments – I love the combination of orange and chocolate. Brownie squares – These are my all-time favorite brownies (gluten free & dairy free, too!). Otherwise this boxed mix is delicious! Pretzels – We love the Glutino or Snyders pretzel twists or sticks for a GF option. Look for the giant ones if you can find them! Gluten Free Animal Crackers or Graham Crackers – Glutino makes the BEST animal crackers! Rice Krispies Treats – I *highly* recommend these Toasted Marshmallow Treats. The flavor is INCREDIBLE. Marshmallows – Feel free to get fancy! Make your own, buy some (Dandies brand and Trader Joe’s are vegan), or pick up some flavored ones. Smashmallow also makes some really fun varieties! Gluten Free Oreos – Sophie especially loves little chocolate sandwich cookies. Kinnikinnik and Glutino brands make sandwich cookies that work well (vanilla or chocolate), or you can sometimes find gluten free Joe-Joe’s (GF Oreo-type cookies) at Trader Joe’s. Add some peanut butter (I love crunchy!) – A spoonful or two will work. I like to warm it up a bit first, then swirl it into the top. Amaretto – I love giving this an amaretto twist with a splash of almond extract. I use about 1/4 tsp, but you can go all the way up to 1/2 tsp if you like. Nutrition facts calculated using a 10oz bag of chocolate chips + 3/4 cup almond milk. Gently melt together the chocolate chips and almond milk in a heavy bottomed saucepan over low heat. Stir regularly to prevent burning. 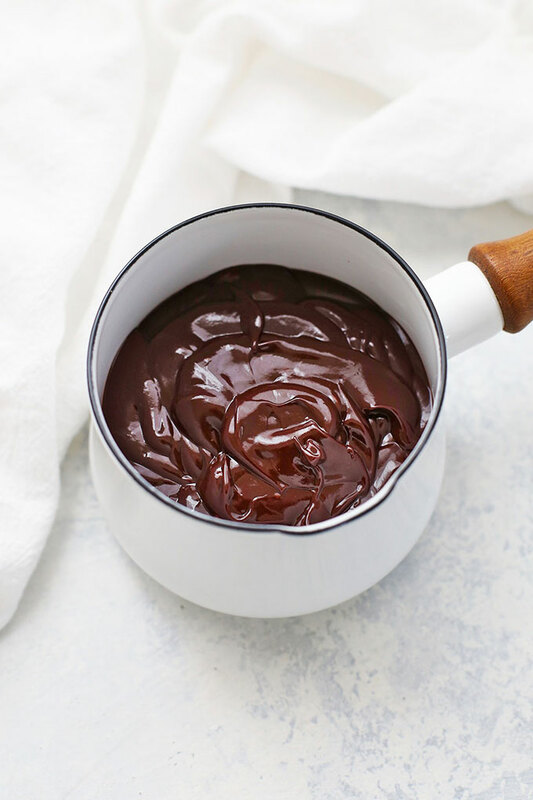 When chocolate is completely melted and glossy, test for texture. 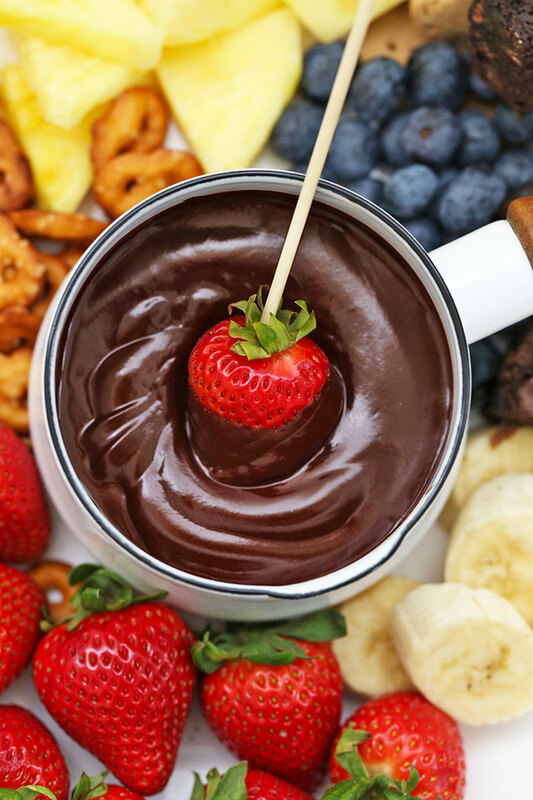 If you’d like your fondue thinner, add additional milk a few tablespoons at a time until you’ve reached your desired consistency. Serve warm with your favorite dippers! We like fresh fruit (berries, pineapple, apples, etc. ), gluten free pretzels or animal crackers, or cut up brownies and cake. « Monthly Favorites – January!! !